Thanks and the sound of falling trees. Well, there is that. What doctor doesn’t dream of the occasional break in the schedule created by a patient not keeping their appointment? Proceed – open the door. I have known this family that makes me hope for a no-show for many years and through several children. On that day though, somehow, we connected. I asked first how their ill father was feeling. I asked about their financial struggles. I asked how school was. Then I turned to the reason for the visit. It felt softer and easier to work together. We left with smiles and, for the first time in ages, they left without an antibiotic prescription. I do not find this physician wellness, mindfulness stuff easy. All the deep breathing tends to send me off for a nap. But on that day, giving it a try worked well. I’ll be S.T.O.P.ing again. After this, the first day of Stanford’s Medicine X conference, my mind is blown and my heart is full. This word cloud of tweets today from @tmlfox Symplur.com analytics sums it all up well. “Patients” are at the center and are surrounded by “empathy”, “team”, “livestream” and “care. 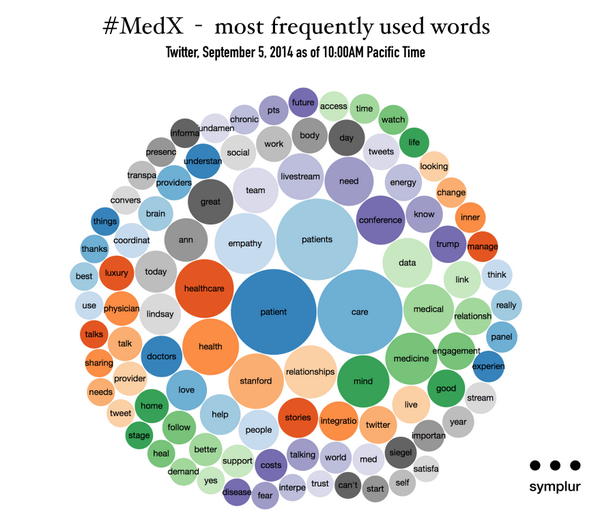 We see “relationships”, “mind” and “stories.” All are the spirit of MedX. All represent why I attend this amazing conference. There is the pure fun of the technology: tweeting, scanning our neighbor’s barcodes and using an app to request blanket deliveries. There are the people – each more inspiring than the next. The food is great and, have you met @therealzoechu? At the end of the day though, none of that is really to the point. Instead, what matters is that I am left here pausing, quietly asking myself how I can be as caring a doctor as medical historian Barron Lerner’s physician father. He was a doctor of another generation. A generation of men faulted now for practicing paternalistic protection of their patients but praised for giving all to their work. They took call 24/7, they took every opportunity to reach out when needed, they went the extra mile. In this era of technological involvement and focus, in this time of schedules and hurry, how do I go that extra mile? How do I pause and turn towards the person in front of me take the opportunity to reach out and care? I have learned a new trick. On a busy day of seeing patients it is easy to run from exam room to office desk and off to the next exam room at a frenzied pace. The charts, the orders even the patients can blur a bit. It is not a way to move through my day. Now before entering the next exam room, I put my hand on the doorknob and pause. I take a moment to notice how I feel, take a deep breath and let it go. I let go of what ever might be distracting me from what is behind the door. Then I turn the handle and focus more fully on the person inside waiting to see me. One day last week when I opened the door there was some fun waiting for me. A boy had a wart that needed freezing with liquid nitrogen. It is a simple procedure that he had done before and he and I settled in to chat while I worked. Also in the room was his much younger sister – maybe five years old. This girl was wearing a dress and holding a rose. She was smiling and excitedly hopping from foot to foot but – not saying a word obviously trying hard to be polite and wait for me to finish up. And so we did. I dipped her rose in the liquid nitrogen and handed it to her. With great joyful enthusiasm she smashed that rose into tiny fragrant icy pieces! Then with wide smiles we said goodbye. She and her brother got their stickers. I went on, placed my hand on the next door knob and fully focused, went to the next patient. I was asked recently by work to write an article for a newsletter about physicians’ experiences with illness. My response to this request was to say that I have been trying to write this very article for a few months and through my efforts I have experienced a new “illness”. It is apparently, quite a powerful one and has had me in its grip for some months now. Its name is writer’s block. Tonight though, relief has come – in the nick of time. I was reading a NY Times article about a minimalist sculptor Carl Andre. It was entitled “Less is Less” which set me thinking. I started a blog site to challenge myself to improve my writing, to practice writing and to observe myself in the role of writer. One observation to date has been about how story ideas come to me – usually by an odd trickling of input from multiple sources coalescing together to form a lit-light bulb moment of “Aha!” and then, out it flows. No different today. After weeks of struggling with what message to write about from my way too many experiences on the other side of the examination table, that title “Less is Less” did it. Less is less? Huh? What? I thought less was more. Exactly! That’s it! Every time I began to write about my experiences with being on the other side of the exam table over the last few years, I had too much to tell. I, doctor come patient, tried telling all the stories and giving all the advice I could. But that was too daunting. Instead I find myself thinking, when telling a story, sometimes less is more and, in the world of forming a bond with your patients? Less is definitely less. Five years ago, I ruptured my appendix while on vacation in Hawaii. When I made it back to the mainland I faced surgery and a week-long hospital stay. Being the patient it turns out, really is hell. And the worst? The worst was that easily 75% of the people involved in my care did not introduce themselves, leaving me to feel lonely and objectified. From the phlebotomists and radiology technicians who worked without verbal identification, to some nurse and doctors. Yes, doctors. After the initial ED doctor took his history, the nurse gave me some blessed pain relief and the CT was done I waited. And, waited. Then, suddenly into my room burst a young resident who abruptly leaned his forearms on my the rails of my gurney (ouch) and said “So! You have an appy!”. I was tired and in pain so forgive me when I tell you that I looked at him and said in my best attending voice, “I am Dr. Land. And, who the heck are you?”. This spring I managed to tear all of the hamstring tendons off my pelvis. The repair for that gave me the chance for another stay in the hospital. What a difference five years have made in the quality of care! Every single person introduced themselves and explained why they were with me. They spoke in terms anyone would understand. From the nurses and technicians to the people cleaning my room and the doctors. Yes, the doctors. This is where more was so clearly more. At my first meeting with my surgeon he entered the room with hand held out, eyes on mine and a calm smile. He sat. He began by asking about me, about my family, about my job. He cared! He went through my chart in careful detail – family history, medical history, medication list cleanup…. all for my hamstring tendons. I was left feeling that if he cared to take the time to hear about my children and my job, if he cared that my mother and father both had lymphoma, that I no longer take Prilosec then – Wow! He must care about me and he must be a very detailed and thorough surgeon. At my first post-op appointment he asked first how I felt. How was I handling the long weeks of braces and crutches and being non-weight bearing? Then he asked how my daughter was recovering from her appendectomy (that last bit falls under the category of “when it rains it pours”). Only then after these kind moments, did he dive into what he was there to accomplish. I learned much from these two times on the patient side of the exam table. Overtly stated, when we as physicians begin properly the rest falls into place. Start with a slow, calm, eye-held introduction. Get to know the person you are with. Then, proceed forward in your work as their doctor. From this beginning success will follow. Language matters. The words we choose can have far-reaching impact on those we interact with. This is arguably more true in medicine than in any other field. Ryan Madanick wrote a recent blog post on the use of descriptor terms used by physicians in patient’s charts. He felt that the use of phrases like “is a very pleasant 52 y/o woman” or “is an unfortunate 16 y/o boy” is inappropriate. I agree. However, in response to this post one reader commented that he felt Dr. Madanick was nit-picking. He isn’t. When I see such comments in colleagues’ note I wince. I was taught well by attending physicians who appreciated the power of language. I was taught to leave judgements like “pleasant” and “unfortunate” out of my notes. I was even taught not to use the ubiquitous term “complains of “or complaining of” (as in Mrs. Jones is a 43 y/o woman who complains of stomach pain”). When I was a medical student I had a trauma surgery rotation. The attending during that time was a wonderfully dynamic and caring man. One morning he brought his wife to rounds to listen in (this was pre-HIPAA). Afterwards he asked her what she thought of the experience. She was outraged. Outraged by our use of language. The patients who needed us most were “unfortunate”, “demanding” and “complaining”. Those we liked were “pleasant” and “stoic”. Those we did not were “difficult”. She asked how pleasant, fortunate and stoic we would each be if we were stuck in the trauma unit after a car accident left us unable to walk or, a bullet to the chest left us struggling to breathe pain-free? She volunteered that it was likely we would all be pretty darned demanding and complaining. These words aren’t only judgmental and fault-finding, they are dangerous. Dangerous in their tendency to narrow our thinking. I had an experience early on that made this point loud and clear to me. Before seeing a patient one night I was handed the chart by a nurse who asked if I knew the child. I did not. She went on to tell me how difficult the parents were and how the kid was a “frequent-flier”. I glanced at the chart before seeing the child and read a few notes all with comments about this “unfortunate” child and her demanding parents. Several days later I learned that after seeing me, and returning to another physician she eventually presented to the ED in extremis. I sat down alone and went back over my visit. The only error I could find in my care was one of perspective. I entered her room biased. Biased by descriptive words used by the nurse and found in her chart that should not have been used. Did I miss her diagnosis because she was in my office too early in the disease process? Or did I miss it because I was viewing her as a complaining frequent-flier with difficult parents? When we enter into care for a patient we need to approach them as if they are a tree of possibilities. The choices of diagnosis and the decisions around care should be narrowed not by our own bias and judgment but by careful medical thought. To speak of our patient’s with critical descriptors is not only rude but it is medically dangerous; doing so hurts them, and leaves us at risk as well. In medicine physicians often talk about the patient concerns that come up in the moment we are leaving the room. The “oh by the ways”. The comments that come when the doctor has a hand on the doorknob, one foot out the door. Mostly, these are simple, quick requests (work notes, PE excuses and the ilk). But every now and then they are real humdingers. Yesterday I had one of those moments, and it got me thinking about what I do and how I do it. Work has been busy lately. The clinic is full of kids with colds, earaches, and influenza; lots and lots of sick kids. The volume of patients is pushing us to be very time efficient, very focused in our approaches to care. Yesterday in the afternoon a teenaged patient came in with several separate non-urgent concerns. We worked through the history, examination and plan for each of these and I needed to move on to the next patient. Make that patients – four were waiting. So when, as I was touching the door handle, their parent asked her if they wanted to tell me about another issue I admit that I inwardly groaned. Outwardly I explained that I had four people waiting and that maybe we could schedule an appointment next week to discuss this concern. But something was bugging me about the atmosphere in the room. Some alarm beeping in my head made me stop, take a deep breath and ask if I could on second thought, hear what was worrying them. It was one of those moments that highlights how much of medicine is an art. Much of being a good doctor involves having an emotional intelligence that helps us know when to take our hand off of the door. I wish that I had never actually reached the door. I wish that I had responded earlier in that visit to the little alarm in my head. There is lots to read on the internet now about how a patient can prepare for a visit with their doctor. Ideas about advocating for one’s healthcare. Making lists of questions to ask. All often form good advice. I would add this piece of advice for patient interaction with physicians: state your fears upfront. Tell the doctor what your biggest worry is. Tell them what keeps you up at night. Doing so is important for several reasons. We can often calm your worries better if we know what to approach. You are your child’s expert and have input that is valuable to us. We may though, need to schedule another appointment. And, of course if the doctor manages to get out the door without knowing that last “oh by the way” humdinger we may have failed to treat the one medical symptom that actually would have scared us and kept us up at night. My teen patient will be fine now but they needed that last moment of my attention. Without it they would be very ill today. The other four patients? They waited and understood that I was late because I had been helping another child. They understood that I not been off doing my nails or reading a novel. That is for today. For more insight into the approach physicians take to office visits read this excellent outline by BrianVartabedian. It absolutely sums up how I also try to structure a patient visit. Medicine and art. Art and medicine. A long paired combination but why? Medicine and art. Art and medicine. A long paired combination but why? Indeed Medicine is termed an art and the influence of studying art on the developing skills of doctors is currently increasingly touted. I have been thinking about this combination and began to write out my thoughts but, while doing so found a beautiful piece to share. The Journal of the American Medical Association features works of art on the cover of every issue. The long-standing cover editor, M. Therese Southgate, MD had the words below to say about why JAMA has kept art so central to its mission. Her words at least in the consideration of the connection between visual art and medicine, are so complete and beautiful they seem to have gotten me out of having to write much more of a post today! First, they share a common goal: to complete what nature has not. Second, they have a common substrate, the physical, visible world of matter. More significant, however, are the similar qualities of mind, body, and spirit demanded of the practitioners of each, painter and physician. Chief among them is an eye: the ability not only to observe, but to observe keenly — to ferret out the tiny detail from the jumble of facts, lines, colors — the tiny detail that unlocks a painting or a patient’s predicament. Many more “affinities” exist between medicine and the visual arts, but I will close with just one: Medicine is itself an art. It is an art of doing, and if that is so, it must employ the finest tools available — not just the finest in science and technology, but the finest in the knowledge, skills, and character of the physician. Truly, medicine, like art, is a calling. And so I return to the question I asked at the beginning. What has medicine to do with art? That’s my opinion. I am Dr. Therese Southgate, Senior Contributing Editor of JAMA. Is Your Child Too Sick for School? Or, When Doctor Land’s Kid Threw Up On The Teacher. Summertime And The Livin’ is Easy – If You Think Like a Kid! © Kate Land and mdmommusings, 2011. Unauthorized use and/or duplication of this material (both written and photographic) without express and written permission from this blog’s author and/or owner is strictly prohibited. Excerpts and links may be used, provided that full and clear credit is given to Kate Land and mdmommusings with appropriate and specific direction to the original content. This is a personal Web site, produced in my own time and solely reflecting my personal opinions. Statements on this site do not represent the views or policies of my employer, past or present, or any other organization with which I may be affiliated. All content is copyrighted.